This is the genial Bob Barrance who has been selling cut-price prepacked food from the same spot in Bacon St for over forty years. Suiting its name, this street was formerly reserved exclusively for food stalls and – pointing out the empty pitches of his long-gone neighbours – Bob recalled the stall that sold hot pineapple fritters, another which dealt in every kind of pickled onion and Tubby Isaacs Jellied Eels, all once keeping him company in the place where today he is the lone trader. I had intended to interview several stallholders that Sunday morning on the Lane, but when I asked Bob how he came to be there trading on Bacon St, the answer was so extraordinary that I realised his testimony must stand alone. “I enjoy the people, I’ve sold to the same people for thirty years. I’ve attended three funerals of my customers. They all know me as Bob and I know a lot of them by their first names too. I absolutely fell into it, my dad was doing this before me and I took over at twenty-one. I come from the Portobello Rd and I used to help out the stallholders, but I never thought I’d do this for life. My dad was a compulsive gambler and we emigrated to Australia to escape his debts when I was fifteen. We were called “Ten Pound Poms,” the Australian government paid your boat fare if you emigrated. We were waiting on the wharf at Southampton when he disappeared, so we got on the boat without him. My mum and seven brothers and sisters, we didn’t even know whether he was on board or not but, an hour after departure, we discovered he had been carried on board on a stretcher and was in the ship’s hospital. The little bit of money we had, he had gambled it away and then had a mild heart attack at the bookmakers. We went six weeks without a penny in our pockets. He won the football pools in 1963 and blew it all on a greyhound that he ran at Stamford Bridge, instead of buying a house. He was the manager of a betting shop, and he ran the tobacco kiosk at the Trocadero in Piccadilly and lost all the takings on the dogs, but as they hadn’t done a stock take before he took over the kiosk, they couldn’t pin it on him. He worked in Hamleys and in Selfridges and he gave us all toys, but they were stolen – three detectives turned up at our house one Christmas Eve and stripped it completely of toys. He worked as a baggage handler for BOAC and he went through all the suitcases. He got a job as paymaster and, on his way to the bank, he’d take all the cash to the betting shop. We’d go to White City every Sunday and Thursday, betting, and he’d come out of there without a penny and we’d get on the bus to go home without any fare. If the inspector came, he said “Two tickets to Acton, please,” which was in the opposite direction, so then we’d have to get off and walk the rest of the way. He’d do lots of silly things like that. He was so clever it was unbelievable, he had so many incredible jobs and he blew them all. He couldn’t help himself. I felt sorry for my mother, he caused her a lot of upset. He used to have the keys to the ICI building in Melbourne, and he went in when it was empty and took all the money from the desks. When I was nineteen, I wanted to come back to Britain to do National Service. I was sick of him, so I took the boat back alone. But when I arrived he was already here to greet me. He asked to be repatriated, he wrote to Harold Wilson, the Queen and the Australian Prime Minister. They flew him back for nothing and had two Rolls Royces waiting at Heathrow for him and the family. He was the only man to go the Australia and back for free! The News of the World were going to do his story and they offered him a nice few bob, but he asked for more money and they dropped it. 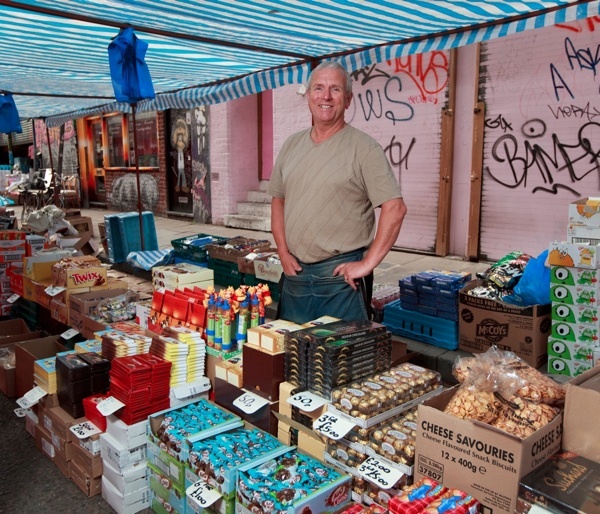 He was working for the man who ran this stall on Bacon St, until he had a heart attack and ended up in the Royal London Hospital. So then I asked the stallholder for the job, but he was worried I would steal from him like my dad did, but I proved myself and eventually I took over the pitch from him. Now I do five markets a week and the rest of the time I am running around getting the stock, selling it is the easiest part compared to that. Two of my kids work for me, though I wish they didn’t because it’s got so tough. Yet I wouldn’t have done it for forty years if I didn’t enjoy it. Even when you wake up and there’s six feet of snow, you still do it. His Dad must have been quite a charming bounder. Just back from a trip to Rough Trade and no sign of your map among the Herb Lester offerings. Is it sold out already? I will have to look out for it again on my next trip there – it’s almost a holy place for my adolescent sons and their far from adolescent dad! His dad would probably now be called a ‘Rogue Trader’. Hurry along to The Town House 5 Fournier St where the Spitalfields Life maps are selling like hot cakes – I’ve just bought one and can assure you that Adam Dant and The Gentle Author have jointly come up with a real masterpiece of design and witty, informative prose. I look forward to ‘Spitalfields Life the board game’…..Meanwhile catch the exhibition of Adam Dant’s other maps of East London, on at that address till Oct 2nd. Don’t go on a Monday though – it’s closed. Thanks, Ros. I shall brave the crowds at Stratford Station (Westfield opening has given those of us in Stratford a taste of our Olympic future!) and hotfoot it to Fournier Street in the next few days. This is one part of Bob’s story I knew nothing about although I have known Bob for many years. Not only does he know his customers but he is a wonderful caring man that me and my partner have had the pleasure of knowing throughout the time of visiting his stall. He is kind, selfless and very funny too. Thanks for sticking around Bob.